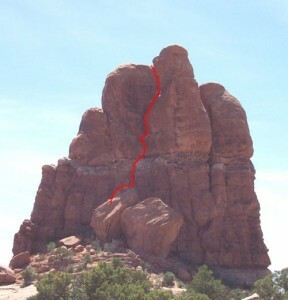 While as nondescript as towers come, Off Balanced Rock does offer some incredible climbing. This is one of the few 5.7 towers but don’t let the rating deceive you: the second pitch hits you a full 90 feet of secure but unprotected chimney climbing. The runout aside, the chimney offers incredible rock and moderate moves making it a secure but wild adventure for the confident 5.7 chimney leader. Which SuperTopo guidebooks include a topo for Northeast Chimney?